Updating my blog for St. Patty's Day. Hope you are all finding the luck and the wonder that comes from this day! Left hand was painted all but ring in three coats of China Glaze Keep Calm, Paint On and right hand was painted all but ring finger in three coats Smoke and Ashes. I added sparkles from LA Splash Cosmetics in Pineapple Coral and Onyx. 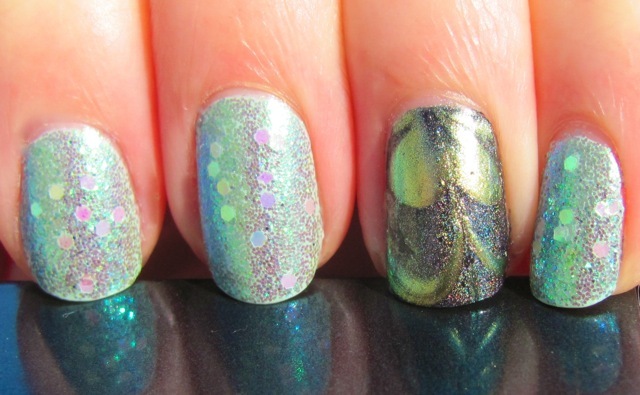 I added in larger Green and Iridescent hex glitter for dimension. 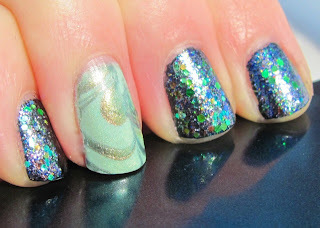 I water marbled on my ring fingers using China Glaze Unpredictable, Rare and Radient and L8R G8R. Left ring marble was over three coats of Smoke and Ashes and right ring was over three coats of Keep Calm, Paint On. OOH! 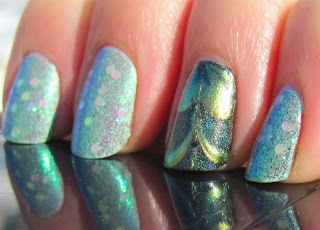 Love the water marbling.